This slow droid was conceived as an assistant to the many miners working in the fringes of the known galaxy. Because of the fact that most of these worlds do not fall under an organised government yet, the rules and regulations concerning strip mining and environmental issues are not so strictly enforced. This has resulted in opportunists blowing up most of the rocks they can find and hoping to strike it lucky. However, as these adventurers are usually unhampered by any knowledge of explosives, a new market for a specialised droid was created. The LIN has a retractable rotor arm that enables it to set and prime the explosive charges as needed, while its owner can relax at a secure location. For locomotion the LIN series droid uses two tracks, each controlled by a set of five wheels. 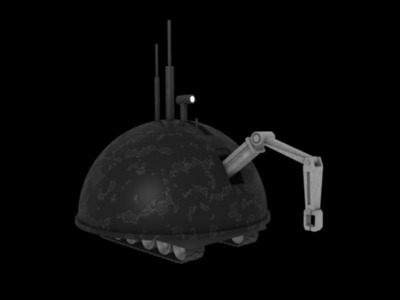 The sensitive inner workings of the droid are covered by a protective dome made of reinforced durasteel. This greatly impedes on the operating speed of the model, but this was considered a fair trade-off by the design team considering the inhospitable environments where the droid would be working. It was considered that it would be under constant threat from falling debris and mining explosions.